Paddle gates can be used to control entry into buildings and areas such as office receptions, stations, libraries and corporate buildings. Compared to traditional pedestrian gates paddle gates can be more difficult to get over or under limited entry for members of the public without the correct entry permissions. 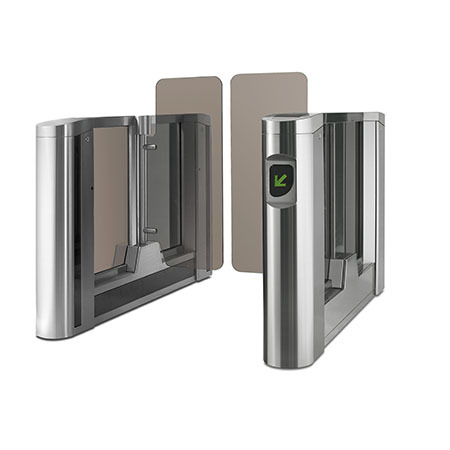 Paddle gate systems can be integrated with other forms of security control such as smart card readers and coin operators, reducing the need for security guards or attendants. Stainless steel paddle gates not only look sophisticated and modern but are durable and able to avoid vandalism or damage that comes with consistent contact with the public. URSA Gates have over 25 years’ experience in the installation of paddle gates and pedestrian access systems. All of our installations include a 5 year warranty. UR-01 is available in two versions: with a standard 650 mm or an extended 900 mm passageway. The extended version provides comfortable access for people in wheelchairs and people carrying bulky goods. Fail-safe operation ensures free passage in an emergency case. The number of the passage zones can be increased with UR-01 double-sided section installation. Each double-sided section creates one extra passageway. The tracking system is equipped with two levels of intrusion detectors, 14 in the upper level and 28 in the lower level, which guarantees passage security at high throughput rate and provides protection from unauthorised simultaneous passage of two or more people. For further details about installing paddle gates at your premises or to discuss your project contact URSA Gates today on: 0800 566 8174 or email us sales@ursagates.co.uk.